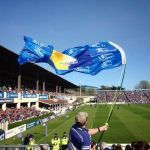 looking for a spare terrace ticket for an old time Leinster season ticket holder (Lee aka Leroy) that some here may know. He's back from the states and if anyone had a spare and wanted to avoid TeamExchange charges then that would be great. I have 2 tickets for the terrace. Pm me your details and I will pass them on. Treat life like a dog: If you can't eat it, play with it, or hump it, p1$$ on it and walk away!